Bringing industry and the Federal government together, Schneider Electric’s recent Data Center Optimization Initiative (DCOI) Summit focused on tackling optimization and efficiency goals for government data centers. In doing so, not only will agencies free themselves to better focus on their core missions, they also stand to better serve the taxpayers. The event was held in Washington, D.C. with an agenda that included high-level officials, whose presence served as a reminder of the significance of the mandate. Tony Scott, only the third CIO in our country’s history, was the keynote speaker, followed by Rep. Will Hurd, Chairman of the House Subcommittee on Information Technology. Schneider Electric’s Chief Technology Officer, Kevin Brown presented on optimizing data centers to achieve DCOI standards, while executives from World Wide Technology (WWT) and Uptime Institute gave their takes on how to move towards compliance. Mr. Scott spoke about how digitization is changing the way public and private sector organizations operate. He called out the goal for not just improving efficiency, but also increasing the capacity of government data centers. Doing so will take investing in new equipment and processes to modernize, he said, rather than repairing old, legacy systems which may seem easier and cost-effective at the time, but prove to be challenging and costly in the long term. Rep. Hurd provided an update from the subcommittee. In particular, he reviewed the Modernizing Government Technology Act (MGTA), which was passed by the House and is up for vote in the Senate. The act could greatly assist agencies in supporting new technology projects, including those needed for DCOI compliance. Essentially, the reform bill would establish (in each covered agency) a working capital fund which may be used for necessary expenses to improve, retire or replace existing IT systems in order to realize efficiency and increase effectiveness. Funds could also be earmarked for a transition to the cloud or other new platforms and for capabilities that address evolving security threats. The 114th Congress recesses December 16 for the holidays and closes out January 3 when the 115 Congress is sworn, so Rep. Hurd encouraged Summit attendees to call their Senators and members of the Senate Committee on Homeland Security and Governmental Affairs to find out more about the proposed legislation and urge them to pass it. A panel session at the Summit rounded out the agenda and featured speakers from Schneider Electric, FEMA, GSA, WWT and Uptime, further reinforcing the coming together of government and industry. DCOI was introduced in March and the deadline for compliance is September 30, 2018. It’s hard to believe we are almost a year in. Since then we introduced a comprehensive Data Center Infrastructure Management (DCIM) offer that integrates the solutions and expertise needed to meet mandates outlined by DCOI. Through DCIM, government agencies can gain visibility and insight into hardware, software and services enabling the strategic decisions necessary for getting to a Power Usage Effectiveness (PUE) of less than 1.5 and DCOI compliance. 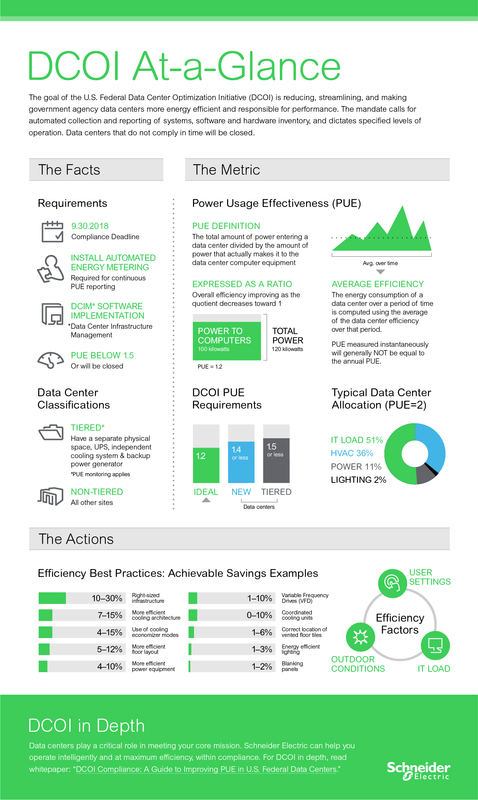 We’ve also created a white paper — DCOI Compliance: A Guide to Improving PUE in U.S. Federal Data Centers — to provide in-depth steps for achieving your efficiency goals. For a quick overview, check out the following infographic, which is based on the paper.